Snow Factor (formerly SNO!Zone) is the real snow experience where you can ski and snowboard on fresh snow each and every day...indoors! We also have fantastic fun activities like sledging. <br> If you are looking to learn how to ski or snowboard - Snow Factor is the best place in Scotland!. 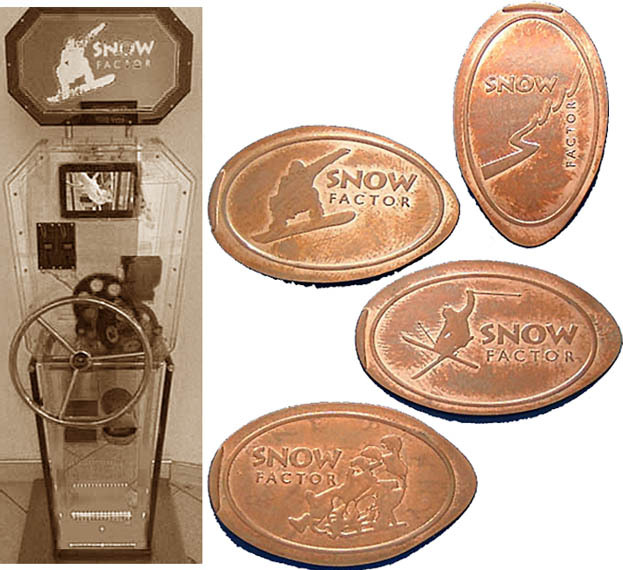 <p> Machine 3 – Solid Border with ‘Snow Factor’ text on each penny. 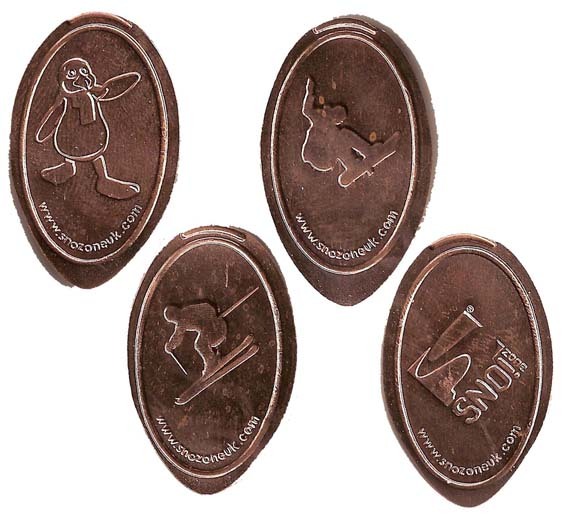 <br> 1) Snow Factor Logo <br> 2) Snow Border <br> 3) Skier - Crossed Skis <br> 4) Children On A Sledge <p> Retired 1 details: Each penny has a solid ring border with www.snozoneuk.com in it and costs £1 and the penny.<br> 1) Xscape logo ...2) Xscape logo in 3D ...3) Building Outline ... 4) Robocoaster at Xscape ...<p> Each penny has a solid ring border and www.xscape.co.uk, Braehead<p> Retired 2 details: Each penny has a solid ring border with www.snozoneuk.com in it and costs £1 and the penny <br> 1) Sno!zone Logo ...2) Penguin mascot ...3) Border ...4) Skier ...<p> Machine details uploaded by <b>David Miller. UKpennies.co.uk</b> <p> Oct 2015 - Newest machine details added. I.T. Hope. Kings Inch Road, Breahead, Renfrew. Snow Factor (formerly SNO!Zone) is the real snow experience where you can ski and snowboard on fresh snow each and every day...indoors! We also have fantastic fun activities like sledging. If you are looking to learn how to ski or snowboard - Snow Factor is the best place in Scotland!. Machine 3 – Solid Border with ‘Snow Factor’ text on each penny. Retired 1 details: Each penny has a solid ring border with www.snozoneuk.com in it and costs £1 and the penny. Oct 2015 - Newest machine details added. I.T. Hope.